Machined from bar stock with an integral, solid baffle that won t shoot out. Top and side ports counter recoil and muzzle rise. Solid bottom controls dust printing. A-2-style looks correct on pre- and post-ban rifles. Includes roll pin for permanent installation. Simplifies conversion of pre-ban barrels to post-ban configuration. SPECS: Steel, black, matte finish. 1¾" (4.4cm) long, ¾" (19mm) diameter. .223 - ½"-28 tpi. Maskinert bar lager med en integrert, solid forbløffe som vant t skyte ut. Toppen og siden porter counter rekyl og Mule stige. Solid bunn kontroller støv utskrift. A-2-stil ser riktig på pre- og post forbud rifler. Inkluderer roll pin for permanent installasjon. Forenkler konvertering av pre-forbud fat å forby etter konfigurasjon. Spesifikasjoner: stål, sort, maths slutte. 1¾"(4.4 cm) lang, ¾" (19 mm) diameter. 223 - ½"-28 tpi. I have one of these on my cavarms builds. Works well and takes out some recoil better than the more expensive ones. I am in a ban state, so it is either crowned or pinned comp/brake for me. I have been looking for a brake that resembles the A2 device for a while and a device that did'nt break the bank. when I found this cav comp..I found my device! It is on a 20in BCM upper and looks great! I will be putting another on my middy lightweight in the furture. Great comp if you want your rifle look like a m4,but want a comp rather than birdcage flash hider for faster 2 shot.Works great on two of my blackrifles.. Least expensive comp that will qualify for NY compliant guns. Comes drilled and with pin for permenant installation. Just place a spot weld over pin. Looks like an A2 flash hider.Bluing finish is a little thin and marks easily. 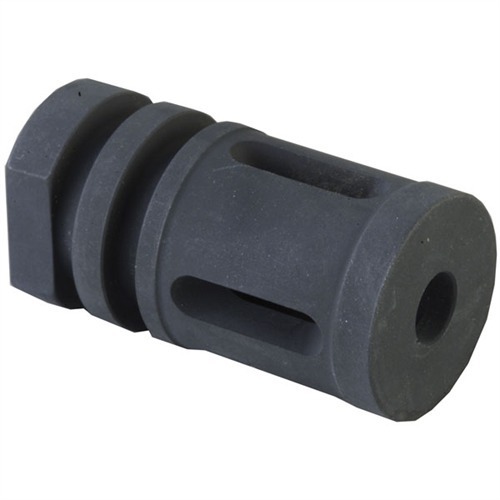 The Cav Comp is a great muzzle brake to buy if you are building an upper and need to replace the flash suppressor with something legal in the "post-ban" configuration. The Cav Comp reduced the movement of my barrel during firing, and it has less of a concussive blast than other muzzle brakes. It is pre-drilled and the pin is even included. Just be sure to mount the Cav Comp so that the ports are in the 9,12,and 3 positions respectively. A mounted Cav Comp also looks more tactical than many of the other muzzle brakes on the market do. Cav Comp 22 Caliber 1/2-28 Steel Black Maskinert bar lager med en integrert, solid forbløffe som vant t skyte ut. Toppen og siden porter counter rekyl og Mule stige. Solid bunn kontroller støv utskrift. A-2-stil ser riktig på pre- og post forbud rifler. Inkluderer roll pin for permanent installasjon. Forenkler konvertering av pre-forbud fat å forby etter konfigurasjon.